Not for the first time, I found myself unconsciously reading two books with very similar themes, characters and bombshell endings back-to-back. Barnes’ Booker Prize winning novel is a slip of a book that deals with big ideas. It was one of those novels that the clichéd, and clumsy, ‘unputadownable’ was first uttered for. I devoured it in a day only to be left… I don’t really know how I felt as I closed it for the final time. There is little sense of the ending, or, if you think about it too much as I did, sense in the ending. Was I disappointed? Surprised? Confused? I didn’t, don’t, know. But it was certainly a gripping read, beautiful realised by Barnes, a writer I’ve always found too cold and studied for my liking. The story is told through the eyes of the now late-middle aged Tony who’s being forced to dig out pockets of memory from the furthest reaches of his mind after he becomes the unlikely recipient of a legacy from his ex-girlfriend, Veronica’s, mum that includes the diary of a school friend who committed suicide that Veronica is refusing to hand over. Tony becomes obsessed with retrieving what is legally his, and his hunt unearths some dark and dangerous secrets and long forgotten memories. The Sense of an Ending flits in-between now and the 1960s when we’re introduced to Tony and his group of pseudo-intellectual schoolboys, amongst them the super-serious Adrian Finn. Tony is that well used literary device, the unreliable narrator. We naturally see the events unfolding through his eyes, both literally and metaphorically. But Barnes gives us enough outside insights – the odd knowing comment from Tony’s ex wife; a letter he sent to Veronica and her then boyfriend – Tony’s former good friend Adrian – to learn more than Tony allows us. The story bounces along, told in Tony’s jarringly upbeat voice, but there’s a sinister undertone that runs through what is an ultimately a rather depressing and sad tale. I found Tony unnerving in his emotional detached, he seemed so distant from his actions and unaware of the damage could do to others with his emotional flippancy and, despite his slight character, he was all too real. The ending continues to haunt me weeks after finishing it. There are so many unanswered questions. I’m not even really sure what I think happened, happened. As enthralling and thrilling as this book was, I was left slightly frustrated; it’s nagged at me almost as much as Tony’s desire for that diary. 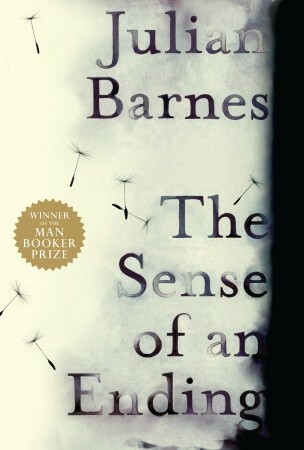 This entry was tagged book review, Booker Prize, Books, Julian Barnes, Sense of an Ending. Bookmark the permalink. I’ve only just seen your comment as it had worked its way into the spam folder – thank you for your kind words!